learning to like more than one kind of beer! some of the big stouts like Abyss, XXIII or Serpents and even 15 from Stone all have flavors that will get masked by cold. but even every day Black Butte Porter benefits from warming. in the USofA Guinness is almost always served too cold as most beer bars don’t have a choice or way of controlling temperature just for one keg. you can taste the difference between all four of these beers. they aren’t very good when you compare this beers to craft beer. in the right context any of these beers could be refreshing. if you do your homework you may come to a similar conclusion. barrel aged beers have proven to be popular in market. and while European beers have been made in wood barrels for centuries it hasn’t been until the last decade that barrel aging was done in the American market. and this is especially true for beer distributed outside of the brewing area done intentionally instead of just a brewers experiment made as a novelty for the people that visit the brewery. Forties are beers that either come in 40 ounce bottles or cost around $40. it’s fall. that means “back to school”. and don’t think that you are exempt from the task. 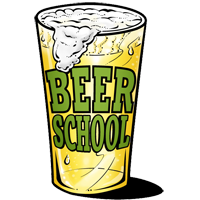 in fact, as a beer drinker going back to school to learn about beer should not be a chore like it was when we were small. learning about beer is always fun even if the beer that is in front of you isn’t your thing. at least you’ll know not to order it next time. Boonville is a short beer festival in middle of a brewers party. Motor has two favorite beers that he will defend to the end. one of them is Ruby from McMenamins. Anchor Brewing got sold. The sky is not going to fall. this is the long though lost IPA show. it was recorded last fall on August 23.
wear our logo every where! the homework is beer but it takes your money to fund the research required to find the next topic. Drink responsible. 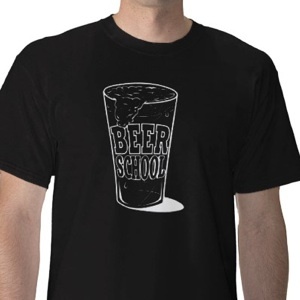 © 2014 BeerSchool.com. Beer School and "The Homework is Beer" are a trademarks of Ayer Media, Inc.